A 49-year-old woman was medevaced from Carnival Dream this morning as the ship was returning to Port Canaveral from St. Maarten. The US Coast Guard says they got the call when the ship was 80 miles north of Cat Island in the Bahamas. It was handled by an MH-60 Jayhawk helicopter crew from Clearwater (Florida) that was operating out of a base in the Bahamas. 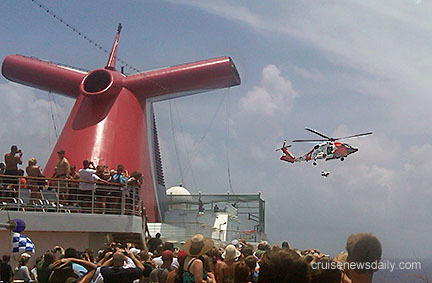 They met the ship and hoisted the woman from Carnival Dream’s aft deck in what they consider a routine operation. In the photo above, it looks like most of the passengers turned out to watch the delicate ballet between the moving ship and helicopter flying overhead which the Coast Guard considers "routine." The photo shows the patient being hoisted to the helicopter just below the door. (Passengers were kept a safe distance away in the ship's central pool area.) The photo was taken by a CND reader who is a passenger aboard the ship. It makes you realize what an extraordinary job the men and women of the Coast Guard do every day, but pass it off as "routine."